For a nation that’s just under 33,000 square miles, Ireland has more than their wee bit of dog St. Patrick’s Day dogs, Just to compare, Ireland is slightly smaller than the state of Maine. We could be green with envy. Here’s a rundown of the dog breeds that originated in Ireland. Hailing from the County Wicklow in Ireland, the Glenn of Imaal Terrier is one of those dogs that’s longer than it is tall, which was perfect for hunting badger, fox, or vermin. No wonder it is one determined doggy—that job requires determination. So, even today it’s no wonder that this dog might chase down a neighbor’s wandering cat. It’s been said that owners of this breed must be more determined than the dog, which may be no easy task. Glenn of Imaal’s do best when owners understand that they are watch dogs and need lots of exercise. They tend to be affectionate to family members. 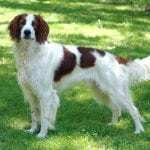 Eclipsed by the popularity of his cousin, the Irish Setter, and the other larger setters (English and Gordon Setters), the Irish Red and White Setter was almost lost to extinction. Fortunately, hunters recognized this dog’s abilities and brought him back from the abyss. He is distinguished by a red and white coat, and is the smallest of the setters. Like all setters, the tendency is for a softer and downright sweet demeanor. The white portion of the coat somehow stays pretty white, as they shed mud or dirt easily. Though a great family dog, they can have a lot of energy, and it seems they are especially adept at playing with kids, though can can still be used as hunting dogs. Irish Setters are one of the most regal and easily identifiable of all dog breeds. Their personality, though, is all about fun. Even their breed description suggests a dog that likes to have a “rolicking good time.” Mentions of the breed date back to the 16th century, and they’ve forever been painted with royalty. 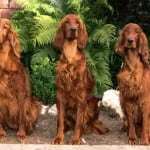 It’s the exceptional Irish Setter that still hunts; as today most are pets, and are wonderful additions to families who have much love to give. Irish Setters are sensitive souls who sometimes have problems with families always on the go leaving the dog home alone a wee bit too often. 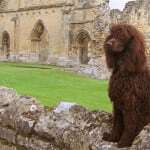 A wash-’n-wear breed with a waterproof coat and weighing in at around 20 to 30 pounds, the Irish Water Spaniel has been around for more than 1,000 years. According to Irish folklore, the breed is the descendant of the Dobhar-chú, a breed long gone. It is probable that more than one ancient breed of spaniel has gone into its makeup, but it is not known from which other breeds Irish Water Spaniels were developed. The acknowledged father of the breed, Justin McCarthy from Dublin, left no breeding records. The Water Spaniel is today is mostly a family dog who happens to love to swim. Some people with allergies can do well with this breed. 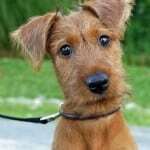 From the County Cork, it’s hard to imagine a breed more Irish than the Irish Terrier. Some dogs are known to protect people, but this breed often needs to be protected from themselves. One of the boldest and most animated of the terriers, this fearless breed is often the daredevil of the dog world. They may impulsively jump off a cliff, or run into a cave without thinking about consequences. They can be scrappy with other dogs. They are natural red-heads with a bearded muzzle. They weigh about 24 to 26 pounds. The American Kennel Club recognition of the Irish Terrier dates back to 1885. At up to 31 inches long, potentially standing 6 feet tall on its hind legs, and tipping the scale at 150 pounds, the Irish Wolfhound is a dog to contend with. At one time, this breed—the tallest of all dogs—was actually considered a “war dog.” They were originally bred to hunt wolf or elk. Don’t worry though, it’s been hundreds of years since Wolfhounds were anything but pets. 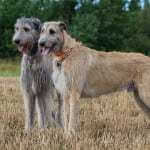 Today’s well-bred and well-socialized Irish Wolfhounds are actually calm, docile family dogs. 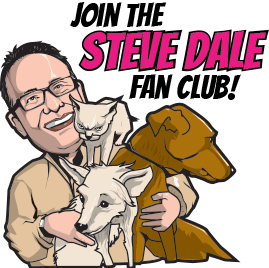 And, it’s no surprise that these dogs generally do a wee-bit better when they have some space to call their own, rather than living in a studio apartment. Sadly, the only complaint is that they don’t live long enough, rarely exceeding must past 10 years. It’s a canine controversy. Most experts agree the Kerry Beagle isn’t all that closely related to the popular U.S. Beagle, which, to make matters far more confusing, was actually originally from the U.K. One of the oldest Irish hound breeds, the Kerry Beagle is thought to be a descendant of the now-extinct Old Southern Hound or from other Celtic Hounds, also long gone. 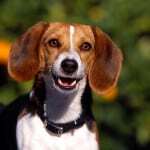 The Kerry Beagle’s drop ears are similar to a Beagle’s, but that is where some say the comparisons stop. Others insist Beagles from the U.K. were, in fact, used in the foundation of the breed. No matter, Kerry Beagles are energetic dogs, good hunters, and, like U.S. Beagles, they are wonderful family dogs. 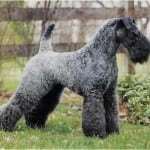 As adults, the Kerry Blue Terrier’s coat is a distinguishing color. 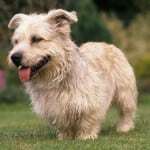 A mid-size terrier at about 33 to 37 pounds and hailing from the County Kerry, this breed is an absolute “Irish Gentleman,” though they also have the common terrier spunkiness. This dog was bred to hunt small game and birds, kill rodents, as well as to herd sheep and cattle. The Kerry Blue is a talented multitasker. Intelligent and brave, this breed became a cherished pet as well, displaying fierce devotion to family. Like the Soft-Coated Wheaten, some people with dog allergies can reportedly do better with these guys than other terriers. 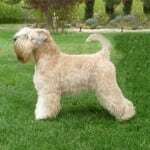 While many terriers do well for people with allergies, it seems even more people can tolerate the versatile Soft Coated Wheaten Terrier, named for his wheat-colored coat. However, that assumption is based on anecdote, not science. Puppies are born with dark red or brown coats. 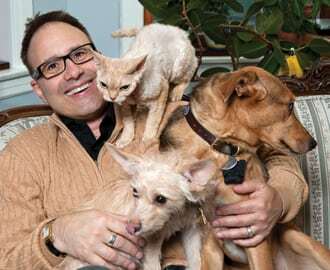 Often, these fun dogs retain puppy attitudes, even into their senior years. Some find this trait endearing (certainly families with children), but others are annoyed. Often described by owners as “cheerful” or “rowdy,” they make great babysitters, as they love their family children, but may get into more trouble than the kids. If you happen to have two children, and also live with a Soft Coated Wheaten, you now have three children. 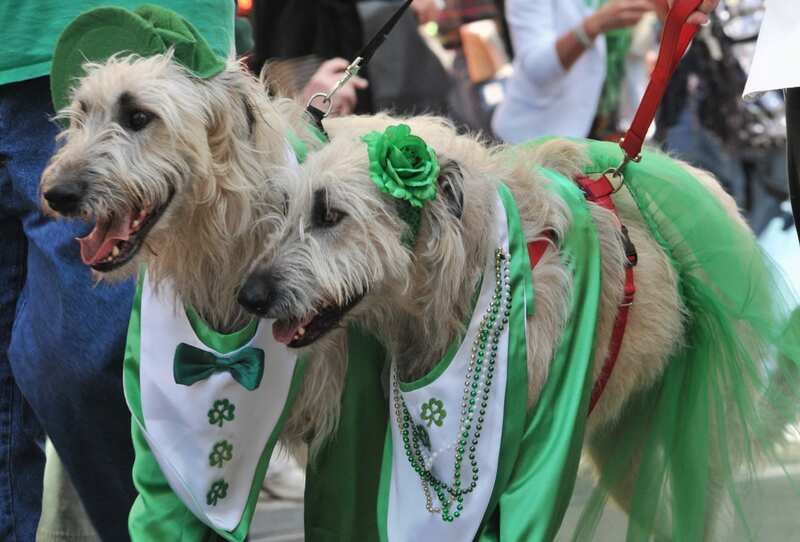 Hope you enjoyed reading about the St. Patrick’s Day dogs.